The relationship between the sun and your skin is a volatile one. 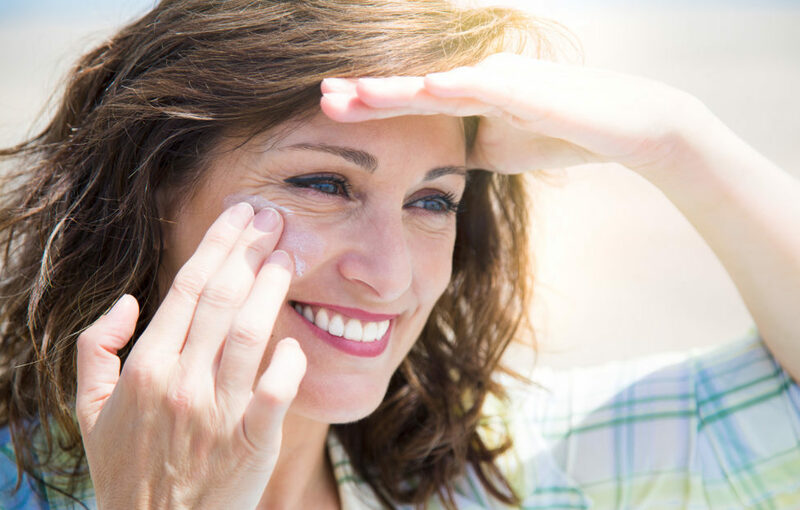 Too little and your body forgoes the many benefits (including Vitamin D and serotonin boosting properties) that moderate sun exposure can offer. Too much and you risk exposing your skin and body to a number of potential (and in some cases life threatening) skin issues. “Remember to drink plenty of water! This will ensure that your skin (and body) stays hydrated throughout the day. 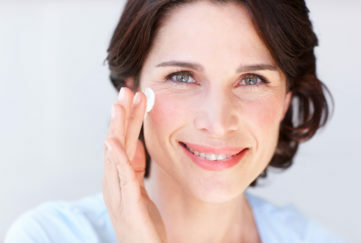 Invest in a broad spectrum sun cream that will protect your skin from the damaging effects of the sun. UVA and UVB rays can aggravate already sensitive skin and make conditions such as couperose, rosacea and thread veins worse. It’s also worth remembering that sun’s reflection of water and sand can intensify sun radiation by up to 85%. Limit exposure to the sun. This is especially important between 10am and 2pm when the sun’s rays are strongest. Limit exposure to dramatic changes in temperature. When spending more time outdoors in the summer, take care to going from intense heat to air-conditioned environments as this can cause the skin to go in to shock and capillary walls to over-dilate causing damage. Successfully managing your stress levels can significantly reduce flare ups of skin conditions such as rosacea and couperose. Learning relaxation techniques such as deep breathing exercises, meditation and yoga, plus a low-intensity exercise programme such as walking or swimming can also help with stress management. Limit food and drinks that can trigger flare-ups such as alcohol and spicy foods. Keep a food diary so that you can keep track of trigger foods. 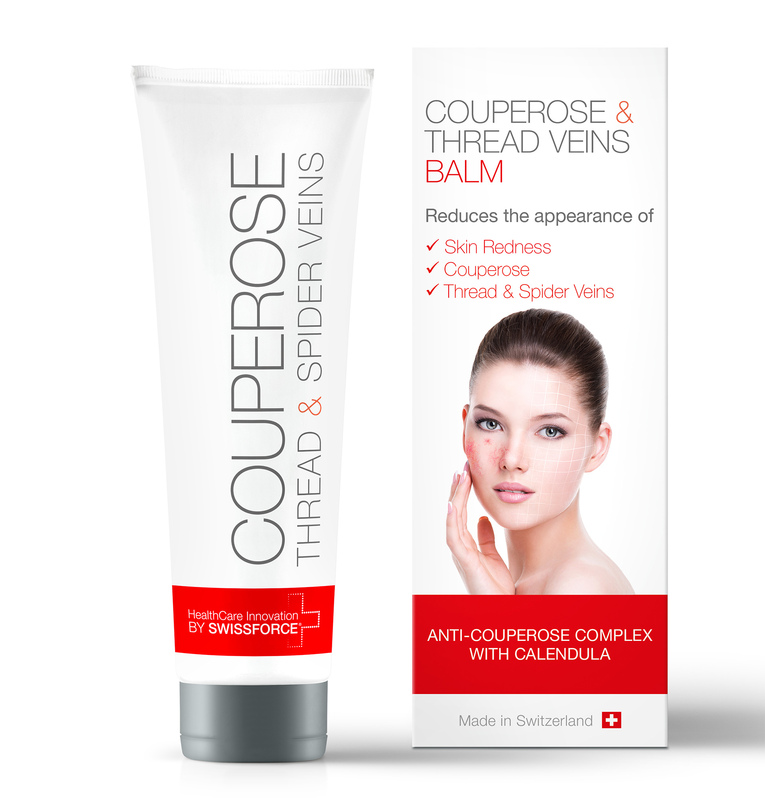 Apply a soothing cream such as the Swissforce Pharma AG Couperose & Thread Veins Balm (30ml), £24.95 that reduces the appearance of Couperose, Redness and Thread Veins, with results in just one week with twice a day application. 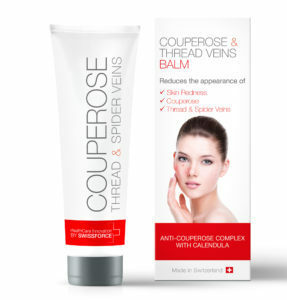 Containing a unique blend of ingredients such as concentrates of red vine leaves, roses, gingko and calendula, along with purple red algae, Swiss cress, soy protein extracts, and Crystal Mint. Enriched with Shea Butter, Panthenol (Pro-vitamin B-5) rice bran oil and vitamin E acetate, this high-quality balm calms, soothes and deeply nourishes the skin, increases skin resistance to reddening and flushing and reduces the sensitivity to triggers that cause flushing. Formulated with natural ingredients – Tried and tested formula – Made in Switzerland to highest standards of quality. 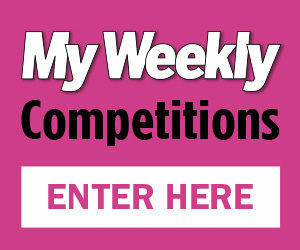 Available from www.amazon.co.uk and www.allcures.com.